When I used to work for myself the pressure was always on. It was often seven days a week for months on end. When we finally got a holiday I was usually totally useless for the first day or so. I felt like that today. It's only been three weeks since Pauline broke her ankle but I hadn't missed a beat since then, looking after her, trying to keep the house in order and doing my other stuff as well. I started off like that yesterday and then Helen came home and said Back Off. It was amazing. It was like letting air out of a balloon. I suddenly didn't know what to do with myself. When I woke this morning that same feeling was still with me and it took all morning for me to get a grip. Eventually I pushed the hoover round, did some paperwork, made a very different stew for dinner and then sat and watched a Sandra Bullock film (Hope Floating) because she is my favourite actress. Then it was time to sleep so that tomorrow sees me back on track. The main roads that affected the Midlands in the days of my youth were the A5, which would lead you south east to London or North West to North Wales, the A38, which was our route to Cornwall and Devon, and the A34 which took us south. We never went north unless it was on a coach trip to Blackpool. The M1 was the first motorway that affected us, in 1959, followed by the M5 and M6 in 1962. Before then, if Midlanders wanted a day out they would struggle for 4 hours to get to Symonds Yat. Suddenly we could reach the Lake District and everything changed. Midlanders began to explore and found the Peak District and the Cotswolds. 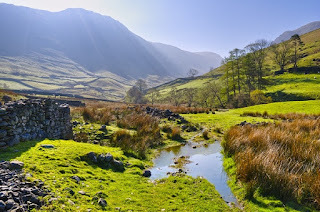 My first experience of the Lake District came in the winter of 1958/59. On December 27th I was put on a train to Kendal where I was transported to the Outward Bound School at Ullswater, where I was to stay until January 24th. These four weeks were life changing to me (and life ending for 7 people on the mountains that month). Although based at Ullswater we explored, on foot, much of the area around and I well remember climbing the likes of Helvellyn, Scafell Pike and Great Gable. Grasmore gave us beautiful views of Crummuck Water. There were no intrusive street lamps in those days and the night skies were bright with millions of stars, not the handful that manage to penetrate the orange glare these days. 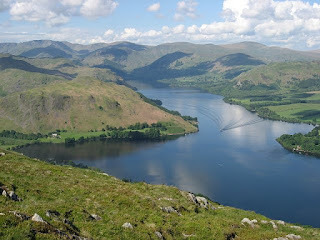 Ullswater is not the longest lake in the area at 9 miles, but it is close to 200 feet deep. It is long and thin and you can paddle from one side to the other quite quickly, but what you become aware of is just how cold the water can become in winter. Our first outing was a walk along the lake and then up to the peak of Helvellyn. Here we learned to scree by jumping onto the loose rocks and digging heels in, leaning back on your ice pick and sliding down, stopping yourself by rolling onto your stomach and digging the pick in. It was adrenaline stuff - and it happened the day before three nurses died at the same spot. Four times we were sent out by the school to help search for missing climbers, but each time the professionals got there first. I had already dealt with my first death by then (I joined the Warwickshire Constabulary in 1957 and was given a baptism of fire) so I was not as upset as some of the others at the thought of what we might find. Some refused to go but I was not the only Police Cadet on the course so we were all anxious not to lose face. Climbing Great Gable was incredible because as we got to the base a great cloud descended and visibility was down to feet.We got to the top but didn't realise it. Suddenly the cloud lifted and the view was inspiring. I've been much higher and looked down on to distant valleys, but nothing was ever as dramatic as that moment. We did rock climbing that was mind blowing. Five hundred feet up a rock face we were faced with a crack in the rock going up about twenty feet. The instructor said the tactic was to put our hand into the crack, make a fist and hang by one arm whilst we reached up and did the same with the other arm. Totally terrified we inched our way up until we could get a toe in the crack as well. Get to the top and all you wanted to do was go back down and do it again! My first trip to the Lake District was no picnic but the experience has lived with me ever since and the love of the area has never diminished. I never thought I say this, but the only way is ethics. With Helen, Dave, Jess and Megan coming home I had to get on with things. I prepared a turkey crown, hiding herbs out of the garden under strips of bacon and ramming a pierced orange where it hadn't ought to go. Then I got the vegetables ready. However, in came the crowd and took over, plus Rita joined us for the afternoon. The big shock was Jessica. Fifteen in a few days and looking down on me, albeit she did have heels. It's only weeks since I saw her and she has shot up. They're putting something in her boots. Megan was a delight and is showing the grace of her ballet classes. Helen and Dave were on good form and relegated me to the benches. That was when I got a surprise. I suppose I haven't noticed that since Pauline broke her ankle it has been non-stop because I'm trying to keep up with my obligations as well as looking after her and the house. To suddenly have nothing to do hit me like a train. The meal was great. The turkey was succulent, Helen does great Veg, there was Christmas pudding and we even got to pull crackers. Who cares if we were a month early? Must get back on track tomorrow. This was a sociable day and so there was no time spent on the computer or other distractions. As such I did no more than contemplate where we are going (on paper) next, and it has to be the beautiful Cumbria. I thought about doing a few hours work today but it didn't really happen. I wrote a letter but then decided the house needed cleaning properly. I vacuumed upstairs and down and cleaned a bit of carpet, by which time Pauline had constructed a shopping list. I ventured up to Aldi and decided winter had arrived. Driving rain and a wind with a real bit. Pauline is fighting her body and it is wearing her out, so I kept close this afternoon, sitting down for a change and getting my 2016 diary ready. It took me two hours to make it up with what I know I'm already committed to, and I haven't put the SNA meetings in yet! Being a member of the National Trust is an incentive to visit many of the great houses. 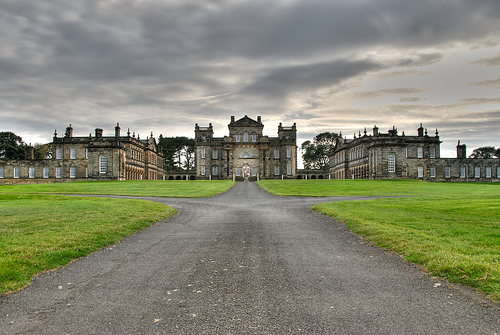 Seaton Delaval Hall is as famous for its eccentric owners as it is for its history, which was sometimes turbulent. The house has not been complete since the great fire of 1822. Built in 1728 for Admiral George Delaval, the completion came too late for both George and also the architect Sir John Vanbrugh. The estate was owned by the Delaval family for over 700 years when the Admiral bought it from an out of luck relative. Although George was an Admiral in the British Navy he was in reality a pirate and all his wealth came from his share of prize ships, very much in the mould of Sir Francis Drake. Restoration work has been sporadic. The National Trust is playing its part but you feel it will be a long time before those putting it together can feel they have met their aims. A lot more visitors would help the cause. The Northumberland coastline is a must see. If you haven't got days, grab a few hours to walk the coastal path. 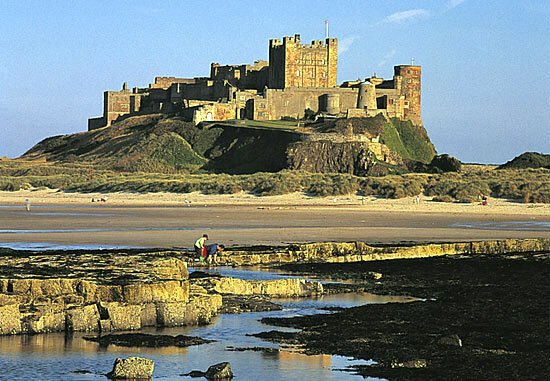 If you've got a week , start at Warkworth and make your way northwards to Berwick upon Tweed, taking in Craster, Seahouses, Bamburgh and Holy Island. 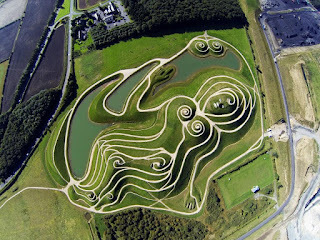 As we leave Northumberland, there is one more place to consider, and it is the quirkiest. 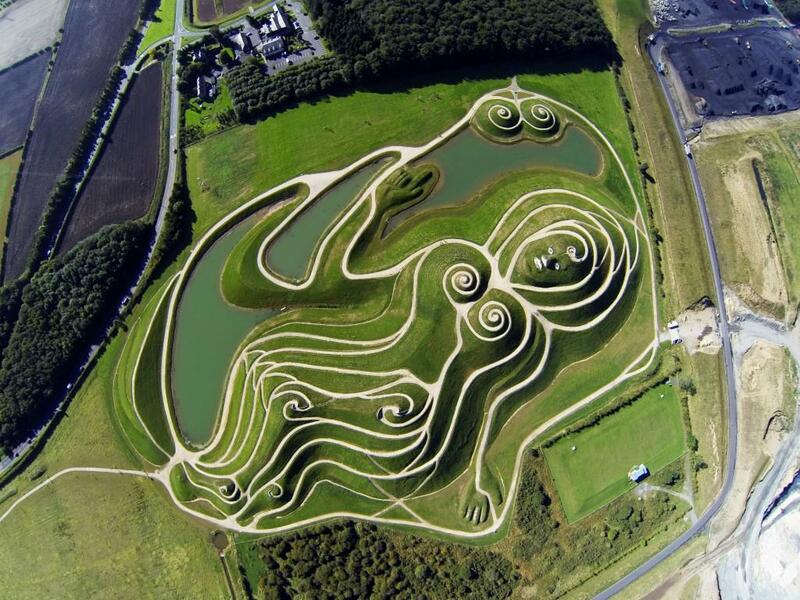 I haven't been there yet but The Lady of the North, who was only finished in 2012, is calling out for visitors and word about it is still only just spreading. I watched its development in the press and will head there the next time we go north. The two main events today included me having the day off and Pauline making it to the shops. It was another grey, wet day, although the official description was Black Friday. We didn't want to see any of the nastiness of last year so we didn't race. I took the talking newspapers to the Sorting Office and then came back and washed the kitchen floor. Whilst that was drying we drove up to Burton upon Trent and put the wheelchair that Chris Pritchard had brought to us to good use. There were no thrashing crowds, just good nature and signs of Christmas, so we did the three main shopping arcades. Pauline was determined that this really was a day off and so we called at a Harvester Inn and enjoyed a three course lunch, enough to say we wouldn't need anything more for the rest of the day. 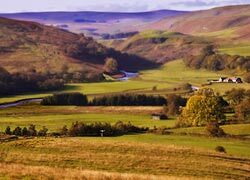 For lovers of the great outdoors Northumberland has a lot to offer. 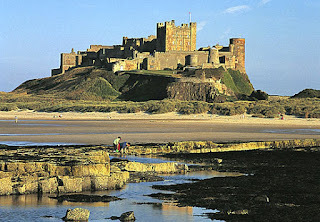 There is the stunning coastline to walk and great open spaces like the Northumberland National Park. A good place to start is the Walltown Visitor Centre. 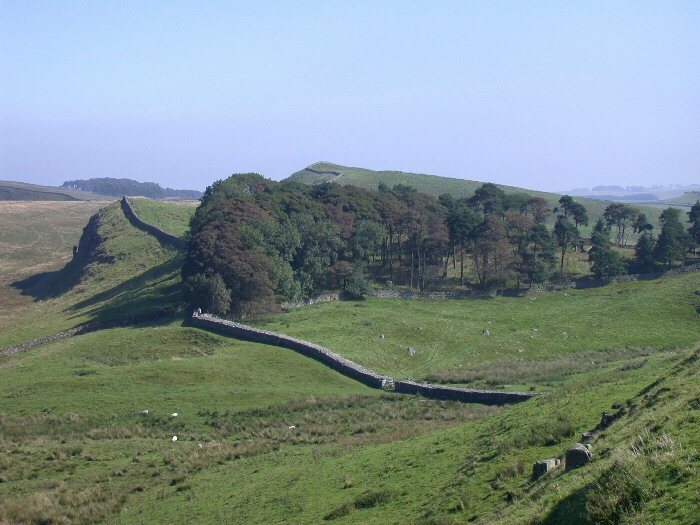 I first strayed into the park when I stopped to look at Hadrian's Wall, which passes through the southern part of the 400 square miles (1030 sq kilometre) as it stretched its way from the River Tyne to the Solway First. In Britain we don't have enormous mountain ranges or thrashing, cascading waterfalls. We are not perceived to have bright and exotic birds (tell that to the kingfisher) and herds of captivating wild animals, but what we do have is often very beautiful and often under-visited, especially in Northumberland. The Cheviot Hills provide some lovely views and also the highest local point with the 815 metre high Cheviot peak. 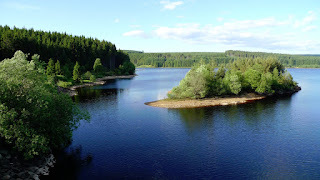 The Kielder Water and Forest Park is another area that appeals to the outdoors man, yet it is mostly false. The enormous reservoir is the largest man-made supply of water in Britain, and the nearby forest, though Britain's largest, was also planted deliberately. The best mood for house cleaning is suppressed anger. Nothing gets stains out faster and vented fury. In death, and sickness, life goes on all around with the vast majority totally unaware. Thus I am still expected to complete my Lions/SNA/Talking News duties whilst looking after Pauline and the house at the same time. That is not a grouse, simply a statement of fact. There was an extra item on my crowded Thursday agenda so I was up well before usual and finished downloading the magazines. Then I recorded the Stevenage Talking News, made the master copy and tried to see to Pauline. Next I went to the Fradley Crematorium for the funeral of Natasha Lamb, wife of Club member Nick. I had exhorted as many Club members as possible to be there because, for some reason, I thought the occasion would not be well attended. I think that conception crept up on me because when Nick was visiting Natasha in Heartlands Hospital is was Club members who did the taxi service. We never let him go on his own. As I set off the sky was black and the roads were very wet. I thought to myself that I will try to die in mid summer so that people can have a picnic rather than a wake. As I approached the crematorium a hole opened up in the clouds and for two balmy minutes there was gorgeous sunshine. I hope that was for Tash. There were eleven of us at the Crem, along with another 90 family and friends. I hope she knew in life what people thought of her. Tash was just 43 years old and leaves Nick and 15 year old daughter Charlotte. She was taken ill as an eleven year old and had to wait 18 months to become the 52nd person in Britain to receive a new heart, at Harefield Hospital. That was in October 1985. For two years Tash enjoyed something approaching a proper life, but was then diagnosed with a serious lung complaint. From then onwards she was essentially an invalid, but you wouldn't know that from her attitude. She met Nick on a train journey as they both journeyed to watch a show. He trod on her foot - twice. That's when she decided he needed looking after and they enjoyed 25 years of a loving relationship, crowned by the arrival of Charlotte 15 years ago. Since we have known the family, Tash has been suffering renal failure, and that eventually led to her death on the 8th November. Her spirit was indomatible and her sense of fun and kindness shone through. She was shipped between any of five different hospitals to provide her with dialysis, which became 5 days a week towards the end. For a few short weeks she was the longest surviving heart transplant recipient in the UK. After the ceremony I went home to make sure that Pauline was OK, then joined the others at the reception in Purcell Avenue. I stayed until 2pm and then went off on a hunt to find copies of the Lichfield Mercury. Back home to prepare a rather poor repaste then off to the studio for 5.30pm to get the talking newspapers finished and copied, plus record and duplicate the Lichfield version. Illness struck and we were thin on the ground. Wilf joined me to finish Stevenage/Scotland and Gwent, Keith came from yet another funeral and Phil and he did the reading. Ben arrived just in time to stop me doing the Lichfield returns, which helped enormously. Peter arrived in time to ask where everyone had gone. The next two days would be challenging and so I got on with it. I started by saying Thank You to two of the members of our club. Then I downloaded the news for Scotland and Wales and took that to the studio. Next to Aldi for the missing bits for a dinner party and finally on to the Sorting Office to pick up three very heavy sacks of returns. I made lunch and then did the returns. Pauline insisted on helping, so she sat on a chair just inside the garage and checked half the envelopes, emptied out the memory sticks and reversed the labels. I was concerned but had to agree that it saved me an hour. An hour off and then to the cooking. Pauline suggested I did the bacon wrapped chicken coupled with the tomatoes and cheese baked potatoes, so I did. She prepared the starter and sweet course. We were ready in plenty of time for Louise and Neil. This is the first time in our 47 years that I have been allowed to cook for visitors, and the meal worked. Louise is looking really good and Neil was very relaxed. Their baby is due on 28th January and Pauline will be going to a Baby Shower next weekend, so we might see them both again before Christmas. Being a member of both the National Trust and English Heritage (along with the Royal Horticultural Society and the RSPB) I am never short of somewhere to visit in Britain, albeit castles and gardens feature on the list quite a lot. In Northumberland, it's hard to avoid them. Work started on the castle in 1096. Northumberland was an important barrier between England and Scotland, a point emphasised by the building of more than 70 castles in the county. The castle was described as 'very strong' but someone forgot to tell King David I in 1136 and he captured it. This was something that happened quite a few times over the next 300 years, though it withstood sieges by King William the Lion in 1172 and 1174. 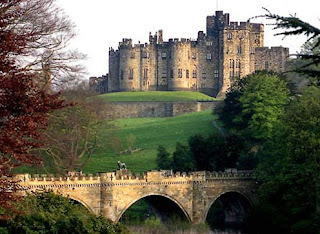 In fact Alnwick was William's downfall and he was captured there. The Percy family bought the castle in 1309 and it has been owned by the Duke of Northumberland ever since. The Percy family also bought Warkworth Castle in 1345 and were obviously mindful of how many times Alnwick surrendered over the years and chose to live at Warkworth. Nevertheless, after the castle surrendered to Henry IV in 1403 and Ling Edward in 1461 it was extended and strengthened to the point where it is now the second largest inhabited castle in Britain behind Windsor. 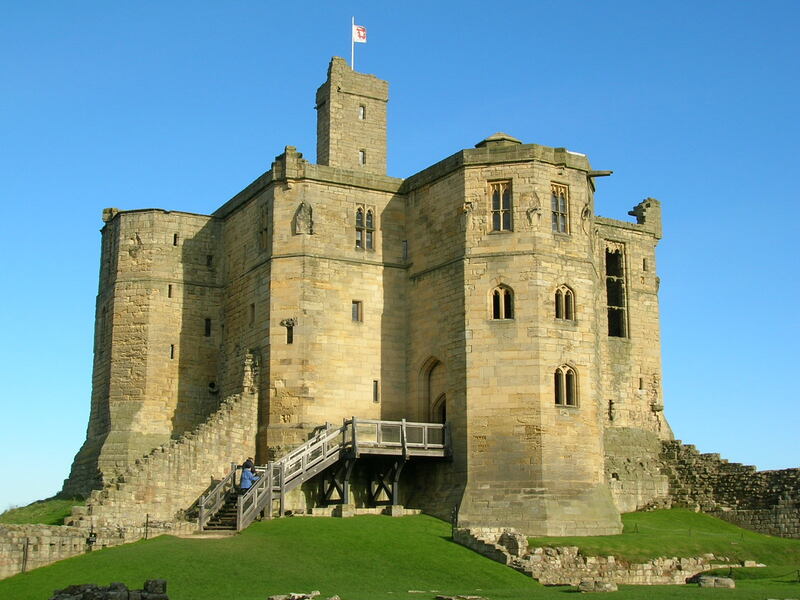 Warkworth Castle is unusual in that it has a cross shaped keep. The first attempt at a castle began in 1139. Although the chosen home of the Percy family for a long time, the castle is now in ruins. It isn't clear why the castle was allowed to deteriorate. Several efforts were made to renovate the most neglected parts but they seem to have been half-hearted at best. My first task today was to produce the minutes from last night's meeting and also to confirm the arrangements for Natasha's funeral on Thursday. I also had a box full of talking news envelopes that couldn't be used because the Royal Mail had pasted stickers all over them. So, an hour in the garage with Sugar Soap and white spirit and £150 of envelopes were back in circulation. Kath and Janet called for Pauline after lunch and took her off to Packington Farm for a slice of cake and cup of tea. That gave me two hours. I went to the Post Office for stamps, then to Beacon Street Village to see Caterina and finally bought some ingredients for a stir fry for tonight. That was a pleasant surprise for Pauline because I can't remember the last stir fry. I used rice noodles and was therefore gluten free. Tonight we had a Lion's board meeting at home. Seven of us together to discuss and plan our next membership drive. If we can move fast enough we will blitz Fradley in December and Shenstone in February. Step 2 miles south of Scotland and you are in the small market town of Berwick upon Tweed. That's now, there were times when you would still have been in Scotland. 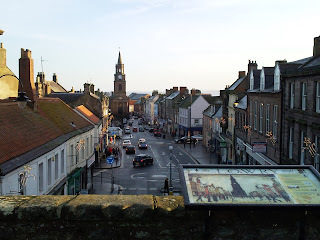 Being so close to the border, Berwick was an important stronghold with the obligatory castle. Stronghold may be the wrong word to use because it actually changed hands with great regularity. You got the feeling that someone left the key in the door and said "Enjoy for a while, we'll be back in six months." For such a small town there is actually quite a lot to see, apart from the beautiful coast line. The castle played its part for about four hundred years. Built by King David I in the mid 1100s, it was rebuilt by Edward I in 1296 but made superfluous by the Elizabethans who built a ramparted wall around the town. Not being from an area where anything goes to waste, the castle was dismantled to build a church and the Great Hall. 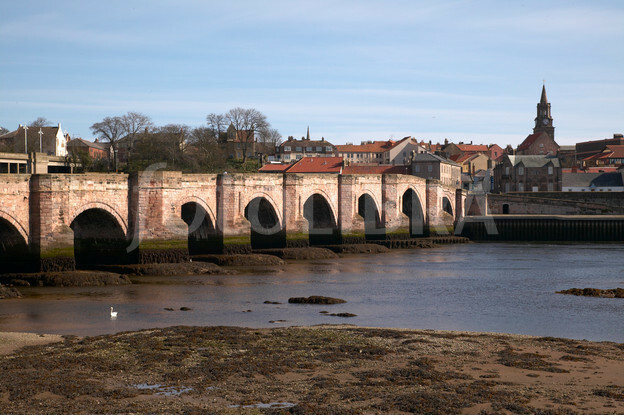 Berwick and its surrounds also feature four important bridges. The Union Bridge is the oldest suspension bridge in use in Britain. Opened in 1820 it was used to extract tolls from travellers passing between Scotland and England. When the SNP won a landslide victory in last year's elections, some wags set up a border control on the bridge, but it didn't last much longer than it took for the cameras to get there. 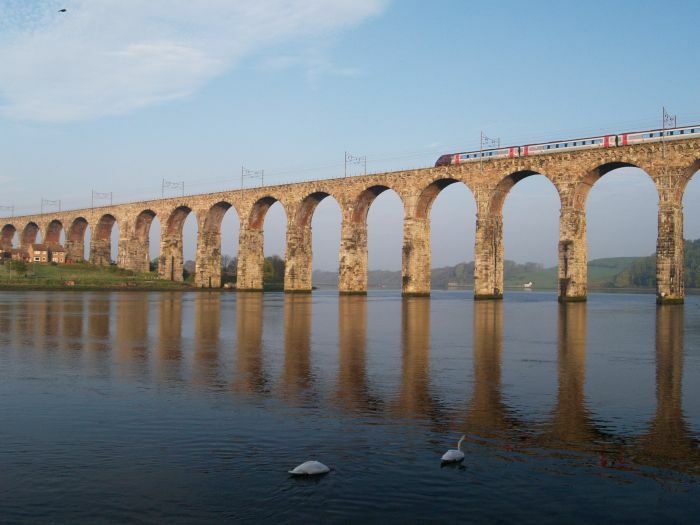 The Royal Border Bridge was begun in 1847 and took three years to build. It became an important railway bridge. The bridge is impressive and boasts 28 arches. 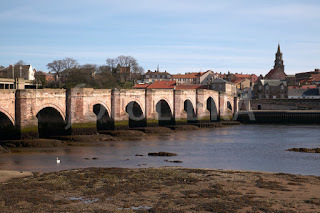 The Berwick Bridge was 13 years in the building, which started in 1611. Part of the reason for such a long time to complete the project was mismanagement, and a propensity for redesign which saw the original 11 arch project become 13 arches and in the end, 15 arches. 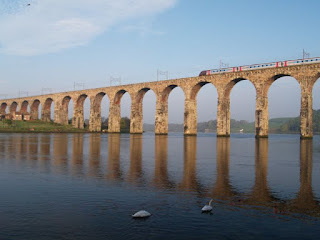 Finally doing the job intended, it soon became superseded in importance and use by the Royal Tweed Bridge. 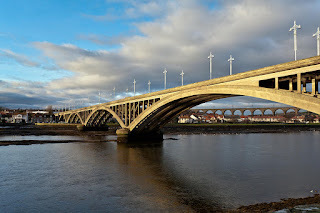 The Royal Tweed Bridge took three years to build, starting in 1925, and it became part of the A1 ride north/south. However, that bridge also lost its importance when the Royal Border Bridge was completed. One other place of interest in the town in the Barracks and Main Guard. The barracks was built between 1717 and 1721 and is now maintained by English Heritage. It has impressive military displays and a popular museum. Timing is everything. Never argue with your wife unless she has severe hiccups. The first real frost came so I waited until the house warmed up. Then I had a lot to do and only wanted to spend the morning doing it, so I got hard at it. I went into town and banked some money, then did a food shop at Aldi and gluten free shop at Tesco. I got home to find Pauline balanced on one leg making omelettes. I decided to stay really close this afternoon and she didn't get away with much. Dinner was a simple affair - homemade chips (potatoes & sweet potatoes) with left over chicken and petit pois. Then it was time for a Lions meeting. I thoroughly enjoyed the meeting. We had a guest and a guest speaker. Ed Rule came to tell us everything about Lion's Youth Programmes. I would like to see the Club involved in Young Ambassador, Young Leaders in Service and the Peace Poster. Our guest said that he thought the meeting was lively, to the point and full of fun. Music to my ears. When I look at a map of England I see that there is not a county that I have not visited. There were places in Scotland and Wales I haven't been to and quite a few gaps in Ireland, but all of England has felt my footfall. I was born in 1941 and that shaped my journeys for the first part of my life. When the Romans started to expand from the South East corner of Britain, they built their roads like spokes out of a wheel. So it was easy travelling north or south and from London even to the west, but if you were in the Midlands there were very few east-west routes, so we didn't go that way. In the days when it took seven or eight hours to get from Warwickshire to Cornwall, you always selected the easiest options. Looking back on my childhood (which in my mind was very happy) apart from trips to Portsmouth or Barry to stay with relatives, I only remember two holidays. One in Blackpool and one in Llandudno. There may have been another to somewhere like Paignton, but it didn't stick. When they built the first motorway it began to make a difference, but the pattern had been set. Most holidays were either in the south west or south Wales. Then my work came along and changed a lot of things. During the time that I made a living writing about the automotive industry, there was a 14 year period when I was on car launches every other week and had a new car to drive every week. There were about thirty vehicle manufacturers organising launches and, with few exceptions, they tried to choose a different venue for every one. In the beginning I was everywhere. I've done launches in France, Belgium, the Netherlands, Germany, Austria, Sweden, Hungary, Czech Republic, Switzerland, Spain, Portugal, Italy and Greece. Maybe a couple of others that will come to mind later. Until I joined the Midlands Group of Motoring Writers we went all over the UK, but after I joined about a third of the launches were in the Midlands, so I've really seen some of those counties. Starting in the north and working downwards. For the first half of my life I had never been anywhere near Northumberland, but now I can say I've seen Lindisfarne, Berwick upon Tweed, the Northumberland National Forest, Alnwick and a few other places that I will touch on briefly over the next couple of days. 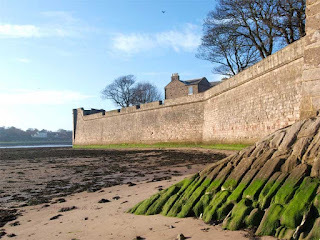 My first trip through Northumberland was en route to Edinburgh and the schedule didn't allow much time for sight seeing, but the A1 carries you just three miles from Lindisfarne, so we agreed to a brief stop, though I had to research most of anything I know. 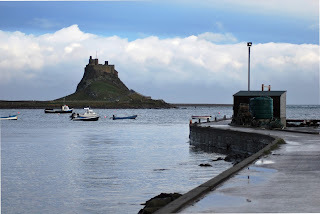 Lindisfarne is known as the Holy Island. 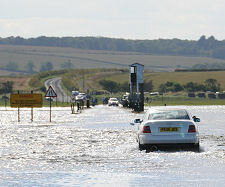 There is a causeway that can be crossed on foot or car (a car a month gets trapped, but there are always drivers who know best, despite a plethora of warning notices), but timing is important because twice a day - at high tide - the causeway disappears. Lindisfarne was chosen by Aidan, an Irish priest from Iona, as the site for a new priory. Aidan was Sainted, as was Cuthbert, but the island suffered a few catastophes, mainly at the hands of the Vikings. The priory was finally abandoned in 1536, having been established in 635. The monks left, after which a castle was built on the highest point starting in 1550. That's shutting the stable door well after the horse has gone to the knackers yard. The island is 3 miles by 1.5 miles and mostly controlled by the National Trust. Apart from the castle there are lime kilns and a surprisingly colourful garden, given the proximity to the sea. You know your children have grown up when they stop asking where they come from and stop telling you where they're going to. Snow around, but not in Lichfield. Quite cold, but cosy for us. Pauline is getting desperate to get at things, but I won't let her. That meant I had to make noises with the Dyson. I also started on the Sunday roast. I'd bought a pre-marinaded chicken from Aldi and took advice from Mary Berry about the roasties. Start conventionally, then add chopped tomatoes 25 minutes from the end, and grated cheese 10 minutes later. I brought Rita round and both ladies were amazed, or did a good job of pretending. We always felt at home in Cork. One of the reasons might have been the Saint Fin Barre's Cathedral because, just like Lichfield Cathedral, it has three spires. As cathedrals go it is relatively new. Work on its construction began in 1863. 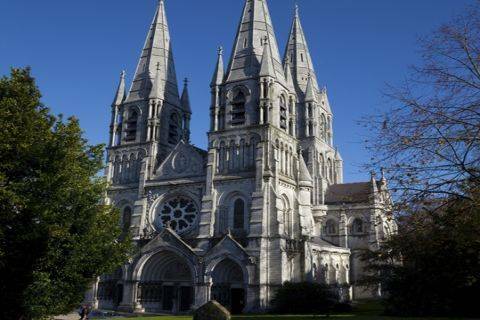 Having said how recent the cathedral is, the site housed a church or cathedral for 1400 years. Kinsale, to us, was magical. We did a reunion there on one visit and stayed close to the busy harbour. Walk around and there is almost a feeling of Tobermory with quaint pastel coloured houses. For some reason we went into a number of pubs and the atmosphere was always electric with sometimes spontaneous entertainment. It reminded me several times of a favourite book from my distant past, The Smell of Broken Glass by Sean Treacy. Sean ran pubs in London's Kings Road in the 60s and 70s, but the funniest stories were always about Ireland. 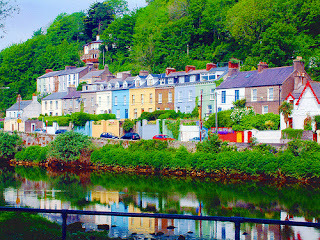 Add to all that the fact that Kinsale is the gourmet capital of Ireland and how could you not go back? 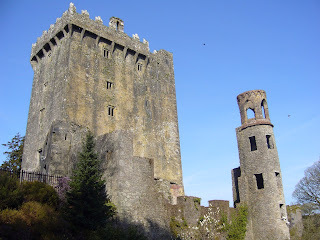 Our trip to Blarney Castle was on a magical day, sunny and brooks babbling and burbling down every country lane as we took our time to get there. I did kiss the Blarney Stone, though there are some who would say I bit a chunk out of it. Whatever, ever since that trip my public speaking got better and better and though I still get very nervous, somehow I manage to string the words together. I've got deja vu and amnesia. I know this because I keep forgetting the same thing. So the cold finally arrived. Pauline wasn't going anywhere and neither was I. After the past week I fancied a day off. I did do a coloured wash and a bit of work in the garage. Rita Thompson came to see Pauline and Gary Nye came to see me. After lunch I did two full hours on the stamp collection. Pauline fancied a risotto and I did a concoction using quorn. I also made my first ever Apple crumble,with a gentle leaning towards a ginger flavour. Then it was a night of light entertainment. Some of my favourite memories involve Cork, especially with regard to Lionism. Our first visit was in 1992 and was the most memorable. The airport sits above the city. We took a taxi ride down and the first thing that got me was a church with a sign outside saying "Now open on Sunday's!" At the bottom of the hill was another sign proclaiming "Paddy Poncheras Mexican Takeaway." The final proof that we were in Ireland came as we booked into the Convention hotel and I heard someone say "Paddy, some of these Convention packs are empty." to which the answer came "Give those to the delegates who don't turn up." The treatment we received was exceptional. We wandered around in a big convivial bunch and the locals made us welcome everywhere we went. Sunday was a step back in time. We saw families going off to church in their Sunday best and all the young girls wore dresses that looked straight out of the Railway Children. But the icing on the cake was what happened on the Saturday night. Because we were there as Vice Governors we were close to the action. Our Youth Award winner was an incredible young lady who, at sixteen, had taken herself off to a war torn city in Czechoslovakia, been shot at, had her shoes stolen, yet had rescued an orphanage. She was rightly feted and an inspired Lion offered her a Melvin Jones Fellowship. Whilst she was on stage basking (rightly so) in this glory, her mother received an urgent phone call to say her son had been hospitalised. When the girl descended from the stage her mother broke the news that they would somehow have to try to get back to England on the Sunday rather than the Monday. A Lion standing nearby said they could swap tickets. He would go back on the Monday. They then found out that his flight was to Gatwick and theirs to Luton. So he passed over his car keys and parking ticket, telling them to drive to the hospital and drop the car off at Luton airport later. We were all stunned by this and the Lion said, "If I'd known I would be staying I would have gone to the Belfast Marathon." to which another Lion said "I can take you there, and we can get your flight changed to go back from Belfast." Stunning and everything I love about Lionism. 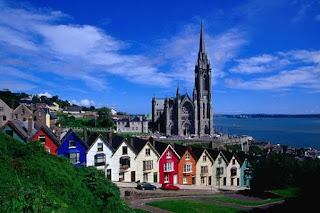 More about Cork, Blarney and Kinsale to follow. Apart from the looks, money, intelligence, charm, charisma and success, what's George Clooney got that I haven't? I like to have Friday mornings off if Thursday has been a big day, but there wasn't much chance of that today. Pauline was going stir crazy so I had to get her out of the house for a while. I packed her in the car and then we went to the Sorting Office with last night's recordings. Then it was round to Rocklands special school to deliver invitations to Santa's Express, run by Burntwood Lions. Next we went to Tesco's where I was able to borrow a wheelchair and take her round the special offers. That over we went to Saxon Hill special school with more invitations. Back home the phone started ringing for Pauline, so I walked up to Aldi and bought food for the weekend. This afternoon the President of the Soroptimists came to see me. They had chosen Young Carers as their main cause to support and had raised a fair bit of money, only to find that CASS has been disbanded. I was able to tell her about Chicks and that they could designate funds specifically for Young Carers, and that eased her mind. "I have been very lucky in my life. I have met some wonderful people, and I married one of them. I have met people exploding with charisma. I have met people who were truly inspirational. I have met people who are famous simply for being famous. But the true heroes, the ones I admire the most, are those who work tirelessly and selflessly to better the lives of others. Who give of themselves every day and never expect recognition or reward, which is apt because they very rarely get recognition or reward. These unsung heroes are my personal heroes and I would like to salute them. When I was District Governor I had it in my power to give appropriate awards. Now I am yesterday's man all I have is the power to say thank you. There are such people in this room tonight and I ask all of you to stand and join me in a toast. If you are a Lichfield Lion and your name is John, please sit down. The toast is - Lions John Cassie and John Whitehouse." I was proud to be able to say that to two very special people. I have never been there, but the most inspirational person I ever met came from there, and was a major player in Lions in Dublin. Bert Mason was the only British or Irish Lion to serve as International Director and at our headquarters in Oak Brook, just outside Chicago, they still have a clock which tells the time in Donaghadee. Such was the love and affection for the man. I first met him in the early 1990s. I was in trouble with old established Lions because they regarded me as subversive. They claimed that I was trying to persuade females to join the Lions. I was! Bert took me to one side and gave me lots of advice, and told me not to give up. I was called before the Council of Governors where I told them where I stood and where I thought they should stand, and they gave me £300 to cover my printing costs. I received regular letters from Bert, all out of the blue, constantly offering support. I met him in Philadelphia and we had a great time for a few hours. He was a man of the people and an inspiration to a million Lions around the world. I always thought he should have been knighted, but we had to settle for an MBE. Because of Bert I took more notice of Dublin than I might have done. For a while it was just a place to pass through when you got off the ferry from Holyhead, but a couple of auto trips gave me the chance to have a closer look. Given all the time in the world I will walk the streets of a city and clock the plaques on walls and look for oddities. In short spaces of time it is the architecture that grabs my attention, especially castles and major churches. 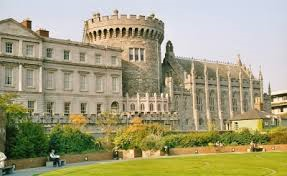 There was a castle on the site occupied by Dublin Castle for eight hundred years but most of what can be seen today is only 200 years old. Nevertheless there is a genuine feel to the place and plenty of space for public displays and such. It is the venue for most State receptions and whilst I had a very good meal there, it is more usual that anyone eating there is sitting down to a State Banquet. I've only ever managed one of those, and it wasn't in Dublin. 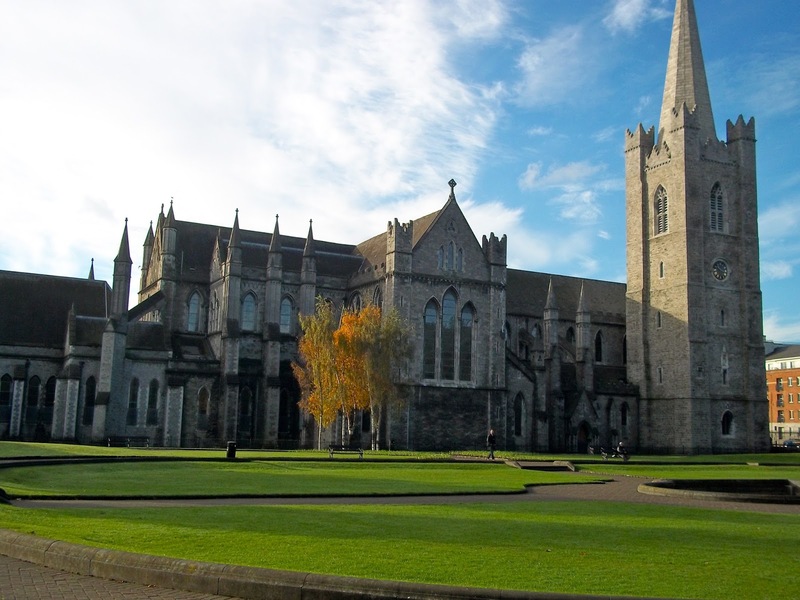 St Patrick's Cathedral was founded in 1191 and is the largest religious building in Ireland. 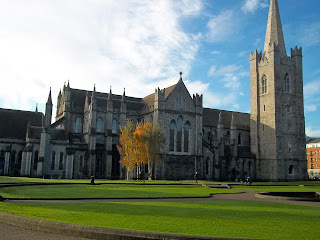 Dublin is one a very few places where there are two cathedrals, and the only one I know of where both serve the same flock. The fact that the cathedral has stayed in place so long is remarkable given the propensity for flooding right up to the door and the fact that the foundations have always been considered at risk. Whatever, no one ever told the cathedral that it couldn't last long, and so it has. The National Botanical Gardens are one of those places where you can visit regularly throughout the year and always find a different scene. The gardens were established in 1795 for the good of the citizens and specifically to promote the scientific study of agriculture. 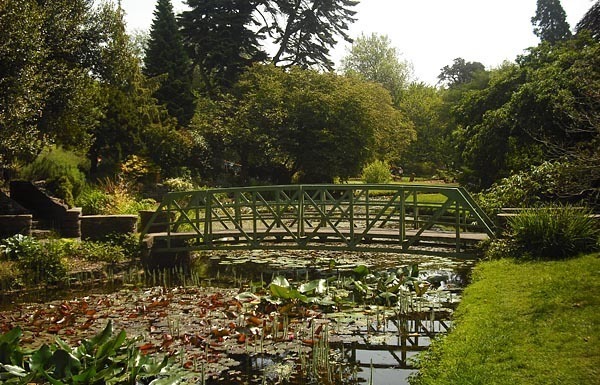 One David Moore, at the gardens, was the first to identify potato blight in 1845 and to predict the devastating effects it would have, but either nothing could be done or people reacted too slowly and famine arrived, and the mass exodus began. I've invented a cure for which there is no known disease. I woke hoping that this would be the last of the manic days for a while. Pauline keeps saying that she wishes I would slow down, but on top of looking after her I've still got my other obligations, and some of those mean leaving her. I got on with it as quickly as I could today. Got Pauline fed and ready for the day and then I recorded the Stevenage Talking News. I downloaded all the magazines and received details of another four new listeners, that I can't start yet because I'm waiting for machines. I did the Live at Home run. I misread the message from Marie, and that was fate. It meant I didn't pick up Pauline Downing (somebody else did) but collected Ray and Gwen. We were just starting off when I saw an elderly lady fall in the road. I stopped and made sure she was OK but she was shaken and emotional, so I put her in the car. I then took her where she wanted to go and we calmed her down during the journey. That couldn't have happened if I'd picked up Pauline. I did the return trip, this time taking Pauline, then went for the Lichfield Mercury. I had to drive all over Lichfield to get two copies. I cut them up and then did dinner. I was at the studio for 5.25 and finished three part-done TNs off. John Whitehouse came to collect our screen and projector and then Keith arrived. Once the readers were in place I set Keith up and left him to do the recording. I went to the Bowling Green for a Lion's Zone Meeting. There were about 42 there and we saw a presentation from a young lady from Chicks, a charity that gives holidays to young carers and children at risk or with special needs (but not profound special needs). Once her presentation was over I went back and finished off the recording. I will look at Dublin in more detail tomorrow but my first ever visit was memorable - to me. Automotive journalists did not regard me as one of them, but the vehicle manufacturers did, and that was all that mattered. Places on launches were very limited so I was amazed when Fiat invited me to Italy for a week, with eleven other senior journalists. You learn a lot about a person in a week and so Fiat learned that my interests were much wider than just the torque of the latest supercar. Fiat have many arms and also run a couple of museums. They staged an exhibition called "The Celts - the First Europeans". 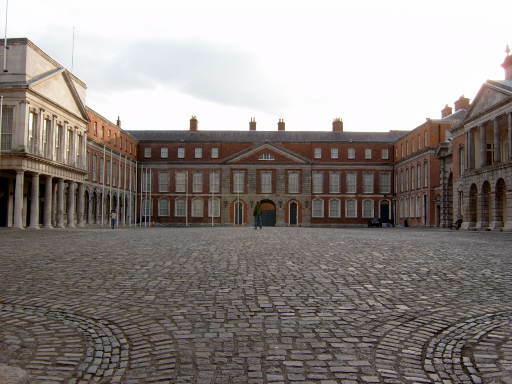 They invited 200 journalists to a presentation in Dublin Castle, and I was one of them. What I found when I got to the airport was that I was the only auto man there. The flight to Dublin was cheery and Irish jokes abounded. "Thieves robbed a Dublin bank. Police sealed all the exits. The thieves escaped through the entrance." There was one journalist from an obscure historical magazine who had the loudest voice I have ever heard. He was also boring but everyone within ten rows could hear every word. Gradually people moved to seats further back that were vacant. You sometimes get a hiatus on a plane when the engine noise level suddenly drops. This happened and the entire plane heard the man say "And she even takes all her clothes off to wash her hair!". The noise level returned and 200 hacks were frustrated not to hear the rest of the story. When we got to the castle we were offered a drink. The man before me asked for a Guinness. "Sorry, sir, we haven't got Guinness, only Budweiser." So he had a Budweiser, and the label said 'bottled by Guinness!' He said "I think we might be in Ireland." The exhibition was interesting but we saw it through a series of slides on a giant screen. We listened patiently to the presentation and then one journalist said "This is fascinating, but can we see the actual exhibits?" to which the answer was. "Not here, they're in Turin." To which the same man said very loudly "Now I know for sure we're in Ireland." I'm getting washer woman's fingers! We went through the now usual trial of getting Pauline up and comfortably ensconced downstairs. Then I had to beg for an hour to do the minutes from yesterday's meeting. The bed was stripped and the duvet cover and sheets were in the washer - the third load so far this week! We are such a clean house. Pauline started cleaning what she could reach, so that had to stop. I hoovered the house, and the bed, and then battled a fresh duvet cover into some semblance of shape. I got lunch and then went to the sorting office for four sacks of returns, which I took into the garage. I'd done Stevenage and Gwent when Gill and Paul came. They stayed a couple of hours, so no work done there. I was expecting a visitor at 5pm to talk about a joint operation between the Lions and the Soroptimists, but she was held up and didn't make it. I got dinner and then Peter O'Brien sent a message to say he was stuck in London, so I went to the studio and we recorded Gwent and the Scottish stick. Once again my visits have been fleeting, but I did get to an event at Belfast Castle. Although the Normans built a castle about 900 years ago, it didn't last the course and the current castle was built from 1811 to 1870. You'd think that taking that long would ensure top quality, but in 1934 the family gave the building to the City of Belfast. 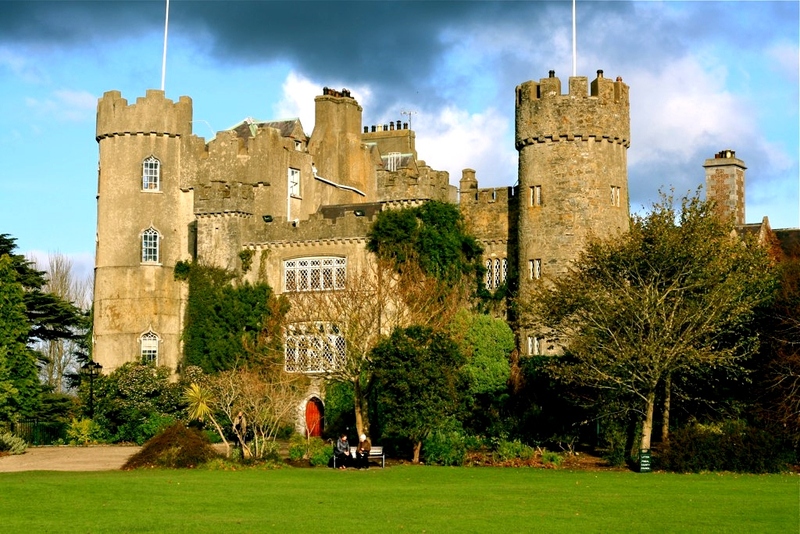 In 1978 the authority decided the castle needed renovating if it was ever to have any use, so that work was undertaken and now it is fit to visit. Falls Park was taken over by the city in 1893. They had the land for about fifty years before that but there was a lot going on. Eventually the park was designed and opened for publi8c use. It even included a stream-fed swimming pool, but Health & Safety put paid to that. My hotel on my Cookstown visit was right opposite Stormont, a fact I didn't realise until the morning, having arrived at the hotel in the dark. The view was enigmatic and imposing. I'd seen the frontispiece and the long driveway many times on the news, but it had more impact and feeling seeing it for myself, and early in the morning with no one else around. And God said "Thou shalt not kill." And the man who recorded his words added "Unless it's someone who doesn't believe in my version of God." I'm finding out what is involved in running a house. In our 47 years together Pauline has shielded me from that side of life. I got breakfast, ran a bath for my lady and then spent half an hour setting up the slow cooker. I tackled some paperwork, made a new list of (growing) priorities, got a coloured wash underway and then got lunch. Rita came round and sat with Pauline whilst I went over to Rugeley to the monthly meeting of the Staffordshire Neurological Alliance. I missed two meetings yesterday that involved the SNA, but they were very understanding. Back home I cut leeks into strips, sautéed them until soft and then melted in cream cheese and some cheddar for a bit of bite. Rita stayed for the main course, and the slow cooker is almost as reliable as Mary Berry. It was not bad. I'm suddenly realising how little I have seen of Ireland, north or south. Belfast, Dublin and Cork have been my main ports of call. 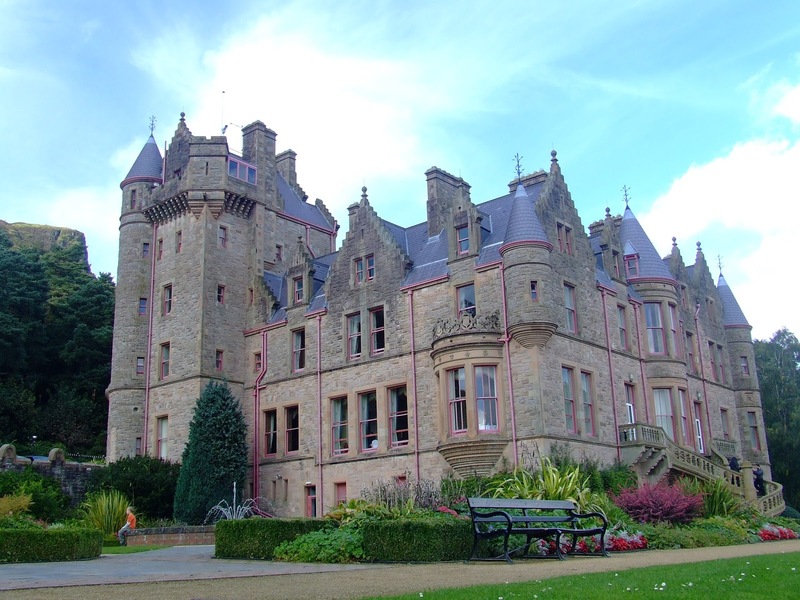 I did get to see Cookstown where I was a guest speaker. Whilst there I was encouraged to find time to see the walled town of Derry and the Peace Bridge, but it hasn't happened yet. Cookstown is surrounded by beautiful countryside and our venue was perched beside a rushing river, but what really caught the eye was the Main Street,which is both the longest and widest in all Ireland. The trip was fairly whistle stop, the people were friendly and courteous,even laughing at some of my jokes, and the message I carried was taken on board. When Mike Wood asked me to go to Ireland last year and address the Association of Talking Newspapers Northern Ireland he asked me to push the point and encourage them all to move to digital technology. On the morning of my flight a plane crashed at Birmingham Airport and it was closed for a day, so I never made it. Then, a couple of months ago, I was asked to go this year instead. Mike said the same message was needed, so I put a speech and Powerpoint display together. They wanted me to talk for half an hour and answer questions for fifteen minutes. Luckily, despite Mike, this turned out to be a good day. I was awake before my alarm was due to go off, which was lucky because I'd set it for an hour late. I was on the road by 6.25am and had a trouble free trip to Birmingham Airport. The plane was not over crowded, took off on time and landed at Belfast City Airport right on schedule. I was met at the airport by Richard Bradley of the Northern Ireland RNIB. He took me into their offices and studio before setting off for Cookstown, about 50 miles away. It was very grey and wet, with a lot of surface water, but Richard is a very confidant driver. On the trip to the Glenavon Hotel in Cookstown he informed me that all of the talking newspapers in the north have already gone digital! So I had to wing it, change my speech on the hoof. Strangely it worked quite well and someone was even kind enough to describe me as inspirational. Although they have gone digital, none of them have gone as far as Lichfield, so I exhorted them to subscribe to the National Talking Newspaper and Magazine service that we use. I asked them to make even firmer contact with their listeners, in short, to throw the whole package at them. And the measure of our giving is the measure of our deed. Richard drove me back to Belfast and the Stormont Hotel. It looked deserted when I got there but I was told that the restaurant was fully booked from 7.30pm, so I was down there at 7pm. This is a nice hotel and I would willingly stay again, next time that someone else is paying. The treatment I got was exemplary and I told them so. Daniel was gone before the dawn even thought about cracking. It was a school day so Reece was up and ready and Roan was trying to find any diversion going to put off the fateful deed. It didn't work and Gary drove them off into the rain, leaving us to get ourselves ready for the trip back home. We left at 9am, thinking the morning traffic would have taken everyone to work, but not so and the first five miles were laboured, under black clouds that emptied themselves and caused rivers across the M23. Not the best of starts, so to cheer Pauline up I said we would be in sunshine in ten minutes. We were! Don't ask me how. Once clear of Brighton we settled down to a good run home. I set the cruise control for exactly 70mph (honestly officer, and I can't explain how we did 210 miles in 3 hours, except the wind was behind us all the way). Birmingham was shut by a traffic accident and so we were forced to leave the M42, but it was on to roads we knew well and the 210 miles took 200 minutes. Pauline was drained by the time we got home. Fred Meddes came to see me, the phone hardly stopped for much of the day, and I did the shopping for tomorrow's visitors, only to find they wouldn't be coming. So I cooked tonight's meal, leaning heavily on Mary Berry, and Pauline even told Helen how good the meal was. Very simple. Baked sweet potatoes with ginger butter and baked cod with a coating of chopped onion, tomato and sun dried tomato. Mary Berry got all the credit. As we move across to Ireland I have to say that I haven't been there half as often as I would have liked and am waiting for the chance to go back. For a few years all of my visits were to the south, but then I was invited on a launch organised by Ford that took in the Giant's Causeway and Bushmills distillery. Following that we did another couple of drives, a big event in Dublin Castle, and the Northern Ireland Society for the Blind had me over as a guest speaker. Everywhere I went the people were charming and the countryside was lush and inviting. Everyone has to see the Giant's Causeway but there is a place in Antrim even more important to me. The first time I saw a photo of The Dark Hedges I didn't believe it was real, but it is and it's a photographer's dream, providing you can get up very early on a sunny day. 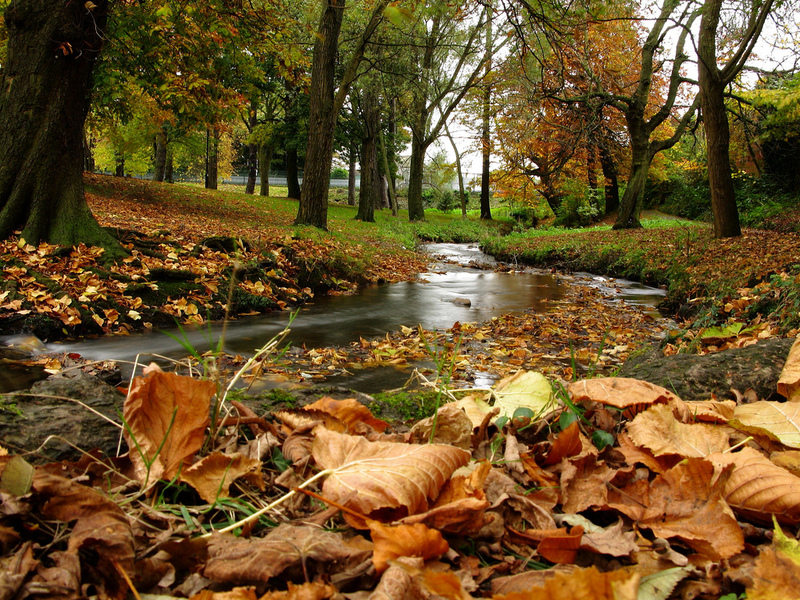 James Stuart built Gracehill House in 1775 and they planted 150 beech trees to make an avenue. Now one of the most photographed places in Britain and Ireland, this magnificent sight with 94 remaining trees is being preserved for future generations. 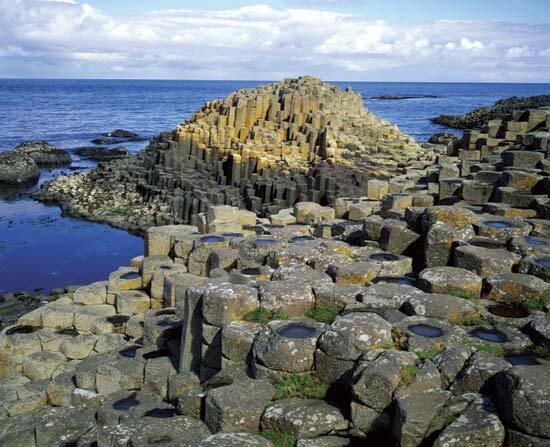 Around 40,000 basalt columns make up the eerie Giant's Causeway (eerie when the light is right, otherwise it is just amazing). 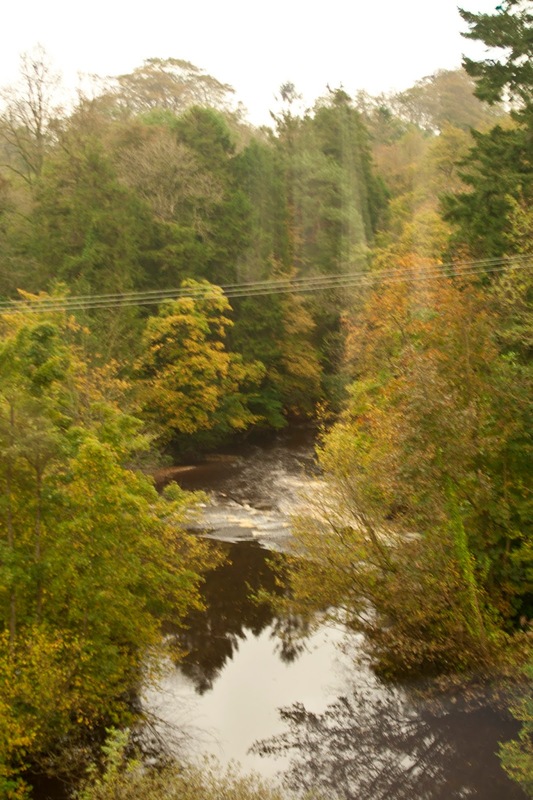 Situated on the coast just three miles north of Bushmills, it's best to see the stones before the distillery. You need some mobility to get to see the Gleno Waterfalls. 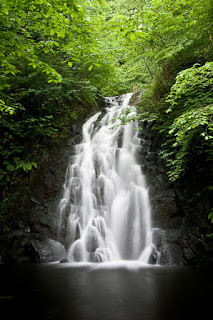 Protected by the National Trust, a variety of paths lead to the falls, rising up and providing snatches of view, then dipping back into the wooded valley. Personally I would walk a good way for an exciting waterfall, and this is worth a bit of effort. There is a walk from the Giant's Causeway, strangely called the Causeway Walk. 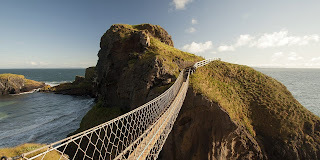 Follow this along the cliff tops and you are in for an even more interesting view because there is a site called Carrick-a-Rede where a rope bridge connects the mainland to a large rock. Anyone with an ounce of adventure in them has to try this out. but there's something I should know. 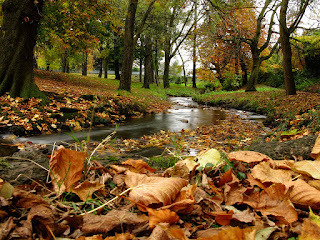 We enjoyed a lovely, gentle morning cosseted from the strong winds and grey skies outside. There was breakfast to eat and Sunday papers to read, and then Sue was with us and it was time for lunch. The venue was The Schooner Inn at Southwick, a pub/restaurant you would happily drive straight past. But that would be a mistake. The reception was friendly and accommodating, our waitress was on her first day and coped well with our foibles, and the food was very good. There was a degree of plate jealousy as everyone looked at the other's choices and thought "Next time." 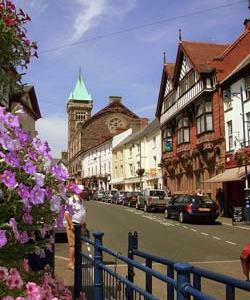 We enjoyed our stay in Abergavenny when we went for a conference for the blind. There was a gentle feel to this ancient market own and an old fashioned feel to the main road. There was iron smelting going on before the Romans turned up, but these days it is the cattle market (established 1863) that provides the main activity. 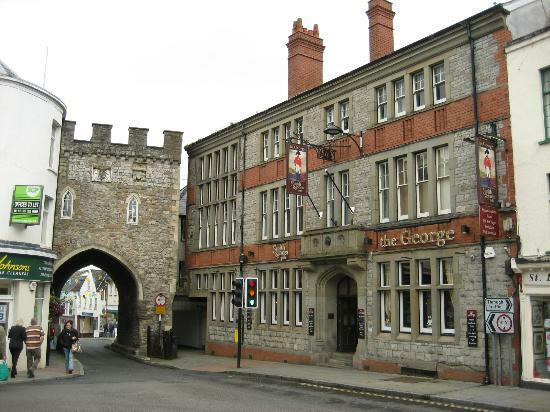 For many years the only thing Chepstow meant to me was horse racing but listeners from the town to the Gwent Talking News gave cause for actual experience. The town was once walled in and remnants of the wall remain. The castle was impressive at its peak, sitting on a small cliff dropping down to the River Wye, which is a reasonable river as it races to meet the River Severn. The countryside around the Wye is beautiful and for a long time Chepstow was important as a port, especially for the timber industry. 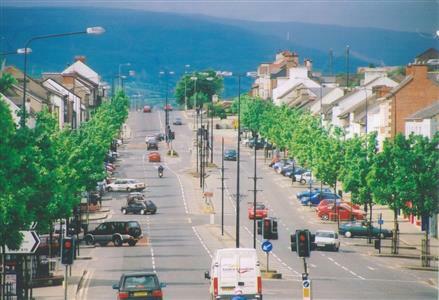 Usk was one of those towns you drove through but never stopped at, but arriving in the middle of the flower Stovall made me stop, because Usk is a multiple winner of Britain in Bloom. 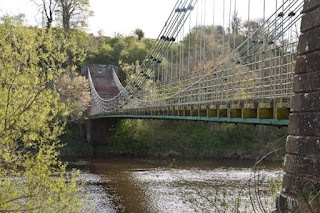 A stone bridge spans the River Usk and a castle (now mostly concealed by trees) once protected it from on high, but was eventually laid low, though it's ruins do remain. 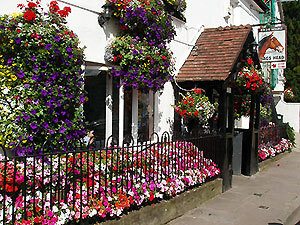 The town has charm at all times but during the festival it is warmly welcoming.